The secretary of state, who testified before the Senate Foreign Relations Committee, faced questions about what happened at Trump's summit with Putin. WASHINGTON — Secretary of State Mike Pompeo dodged questions from lawmakers Wednesday asking for specifics on how North Korea defines "complete denuclearization" but acknowledged that a great deal of work lies ahead. Pompeo told members of the Senate Foreign Relations Committee that he "will concede there is an awful long way to go" following President Donald Trump's historic summit with North Korean leader Kim Jong Un last month in Singapore. Pompeo cited ongoing talks between the United States and North Korea when asked for "verifiable evidence" that Pyongyang had begun to take steps to denuclearize. A month and a half after the summit, the two sides appear to be at odds on what denuclearization means and how it might be verified. After Pompeo's most recent trip to North Korea, Kim accused him of making "gangster-like" demands. The South Korean news agency Yonhap, however, reported that North Korea is expected to proceed Friday with the repatriation of the remains of an unspecified number of U.S. soldiers killed in the Korean War. Friday is the 65th anniversary of the 1953 armistice agreement that ended fighting. The return of the soldiers' remains was one of the agreements Trump and Kim reached during their landmark meeting. South Korea President Moon Jae-in said Wednesday during a meeting with Harry Harris, the new U.S. ambassador to Seoul, that a transfer of the remains would boost momentum for nuclear talks. Pompeo also testified that he has personally told top Russian officials that there will be "severe consequences" for any interference in U.S. elections or the U.S. democratic process. Pompeo told skeptical members of the Foreign Relations Committee that he had made the warning clear to Russia in multiple meetings and conversations. Pompeo made the comment in response to pointed questions about details of Trump's one-on-one meeting with Russian leader Vladimir Putin last week in Finland. Both Republican and Democratic members of the committee demanded details from Pompeo about the summit, for which the White House has offered only vague outlines. Chairman Bob Corker, R-Tenn., opened the hearing by saying Pompeo was appearing before senators who have "serious doubts" about Trump and his foreign policy. Meanwhile, Pompeo said the United States will never recognize Russia's annexation of Crimea and will continue to insist that Ukraine's territorial integrity be restored. 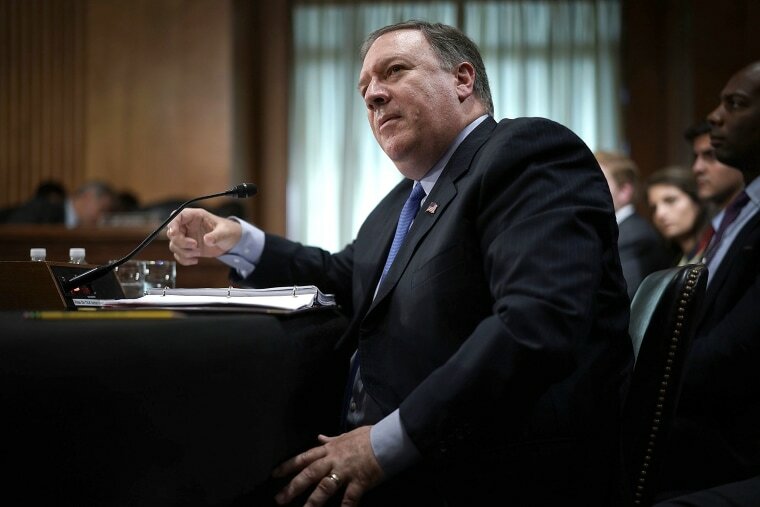 In a statement released Wednesday by the State Department, Pompeo said the United States would hold to its longstanding principle of refusing to recognize the Kremlin's claims of sovereignty over territory seized by force in violation of international law. He called for Russia to respect principles and "end its occupation of Crimea."